Happy Beds is the UK’s fastest-growing bed store. It is one of the leading retailers and distributors of bespoke beds, mattresses, furniture and headboards. Ecommerce is central to everything the company does, and innovation is the core reason it has been able to forge its place in a highly competitive marketplace. 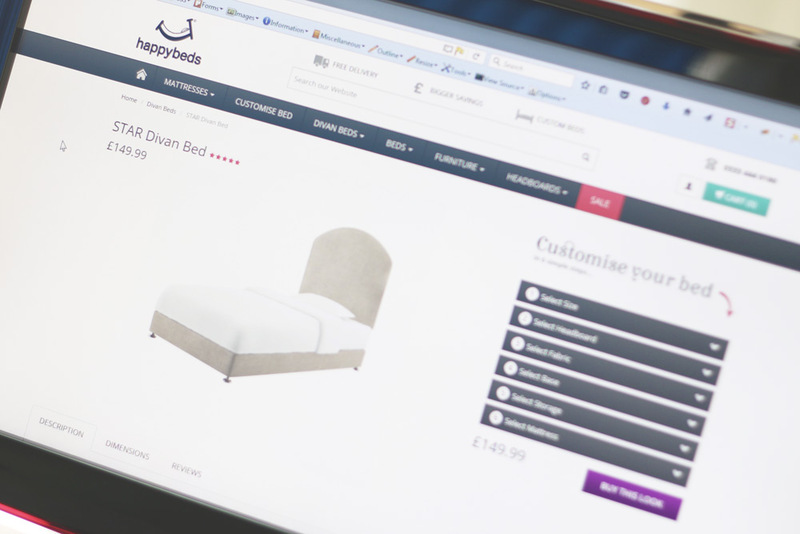 So as we delivered bespoke Magento ecommerce development, we knew how vital it was that the site was innovative, reliable, secure and allows the Happy Beds team to rest assured knowing their site is a problem-free, industry-leading, sales generator. To be the fastest-growing business in any market takes something special. For Happy Beds, that’s a bespoke, six-stage product configurator built right into the site that allows customers to construct the bed of their dreams. Variations include size, colour, storage options and more. All told, there are 5,000 possible combinations, and we built the Happy Beds ecommerce site to not only handle any composition of the customer’s choosing, but to view images of the bed updated in real-time. 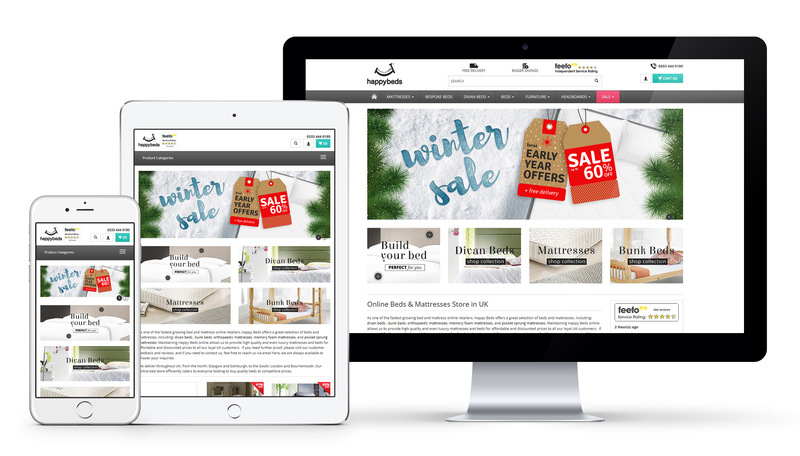 The module, built by the eBusiness UK team using Magento, is unique in its market and comfortably set Happy Beds ahead of the competition. 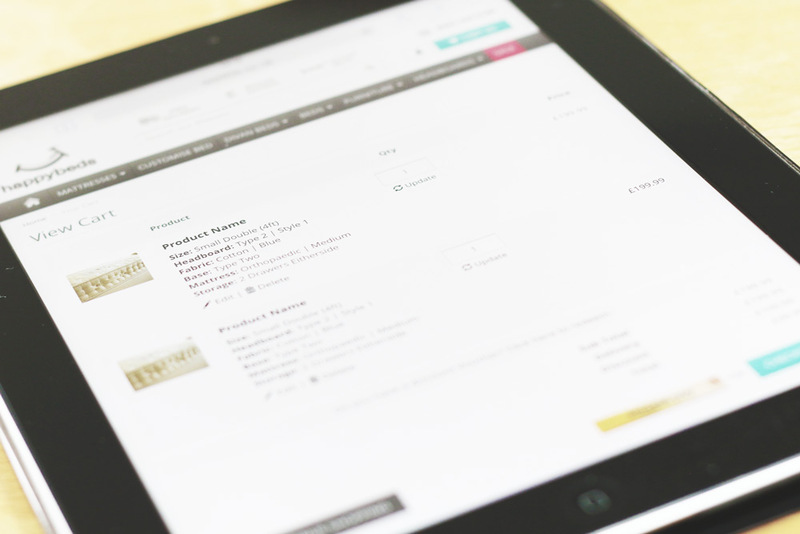 A successful ecommerce site doesn’t just serve existing customers, it draws new audiences in. To achieve this for Happy Beds, we built in Google Shopping connectivity, opening up the company’s products to many more shoppers. We also provided a Search Engine Optimisation service, which ensures the website consistently ranks highly with all the major sites, and we deliver a content marketing plan that includes a daily blog keeping the site rich in keywords. Between the optimisation and the regular updates keeping the site looking fresh, Happy Beds was able to improve its rankings and visibility for very competitive keywords. Any successful selling operation needs a solid mechanism behind-the-scenes to ensure all processes run smoothly. We recommended and implemented a complex delivery integration system, which allowed Happy Beds to share information with its Linnworks accounting and inventory software. This allowed for centralised stock management across all its sales channels. Now Happy Beds has a slick operation, all the relevant information at their fingertips, and peace of mind that their store runs like clockwork. eBusiness UK gave us a personalised and in-depth analysis before carrying out all work within the set time-frames. They offer a very professional and passionate service, which is meticulous and transparent. We definitely recommend them for anyone wanting to grow their online business.